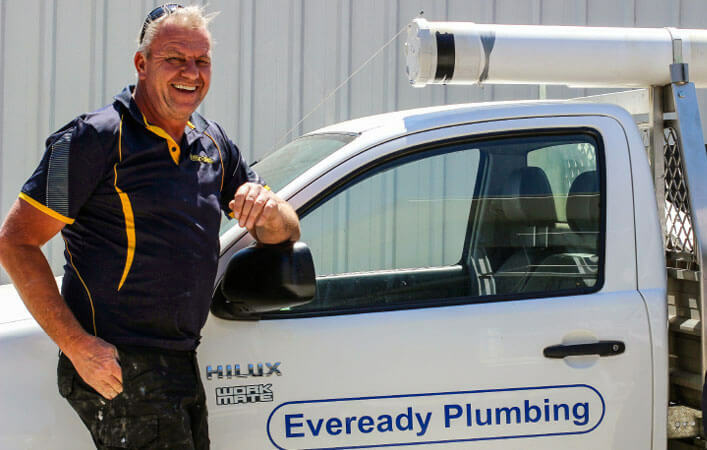 Congratulations to Peter Laurent, owner of Eveready Plumbing, and his team who are this year celebrating an impressive 30 years in operation – no easy feat for any business. It’s an opportunity for Southern Plumbing to celebrate too because we’ve been working with Eveready Plumbing since the beginning. Eveready Plumbing pride themselves on delivering quality service within their customers’ budget. “We offer 24/7 plumbing services just as we have done for 30 years now. Our talented plumbers are friendly, respectable and highly trained,” says Peter. There have been many noteworthy moments over the years including taking on new staff, celebrating staff achievements, growing the business and changes to the industry. This year Eveready Plumbing also celebrates employee Dane Buckley being with the company for 20 years. “To recognise Dane’s dedication and to share such a significant company milestone is truly special,” shares Peter. Three decades on and the Canberra-based plumber still provides quality plumbing, with the addition of new technologies and product advancements as the difference. Peter shares that the biggest change to the industry has been the introduction of the EZIPRESS system. EZIPRESS provides a comprehensive press fit system for copper tube suitable for water, gas and solar applications. Peter Laurent with Patrick Read of Southern Plumbing Plus, still laughing after 30 years. If you bump into one of the familiar faces of the Eveready Plumbing team, stop and say “congratulations” should you feel the inclination. Thirty years in business is a big milestone and continues to reflect the strength and collaboration of Canberra’s plumbing and construction community of which we’re proud to belong.